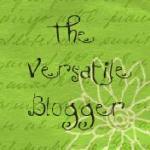 Last week, I was honored to find that Life Inspired by the Wee Man had given me the Versatile Blogger Award. Thank you! I'm so flattered. The rules are, share seven things about yourself and give the award to seven bloggers you admire. #1) My favorite city is Boston. I love the look of the older buildings mixed perfectly with the newer construction. I love that it's ALWAYS under construction. I love Kenmore Square in particular. The chocolate shop on the bottom floor of that hotel, the Turkish pizza joint that sells yogurt, Nuggets...I love that you can just walk over the bridge and you're at Fenway. I love the hole-in-the-wall sushi joint where you order your rolls with a pencil and paper. I love the T, especially the green line. Two hops and a jump and you're at Quincy Market (yes, you have to switch to the red first), or Copley, or the pier (if you switch to the blue). There is no city in the world that beats Boston for me. #2) I hate the phone. I hate dialing it, I hate hearing it ring, I hate answering it, and I hate having to have a conversation with whoever is on the other end. I just can't get into the phone. Typing is so much easier and efficient. #3) I was declared the worst employee ever at my first job at a small pizza drive in. I was 15 and going through a growth spurt. I was always starving. I was found hiding pizza slices under newspapers and behind the milkshake machine so that I could take a bite here and there between customers. My boss was unamused. #4) My favorite food is Cap'n Crunch. #5) My closest neighbors growing up were an old couple who had been married for 60 years. The man was good friends with the chemist who came up with toothpaste. #6) I have more than 50 first cousins, but my babies are the only twins in the family. #7) I am the oldest of three. My younger brother is the director of a specialized school system that tutors special needs kids. My sister will soon complete her doctorate in biomedical engineering. Why, yes, I feel underachieving. Why do you ask? RULE #2: Bestow this award upon 7 deserving bloggers. City Mouse in a Country House - delectable pictures and stories of a life I'd want to live. Farren Square - honest, from-the-heart blogging about life, parenting and self. Teaching Ain't For Heroes - a rare inside look at the state of school systems from the trenches. Feminist Mom in Montreal - blogging with spirit and grace about the questions that plague the best of us. Jansen Family Adventures - if you've got babies younger than toddlers, you'll appreciate this one. The Crafting Hobbit - she's craftier than I am, with lots of great ideas leading to cute projects. No Monsters in my Bed - she likes Alice Munro, cheap wine and sleeping in...and she's not me! If you are looking for new reads, check these blogs out! They are truly fantastic! Oooh...I don't like the phone either! My favorite is face to face. Thank you for sharing the award! I'm so honored! This made my day! So thank you very much! I hate the phone so much that I got rid of voicemail and turned the ringer off (I basically only use it as a gps). I've never been to Boston, but I've always wanted to go. So nice to meet you! !